Meal planning and prep is what got us through life when we were both working full-time corporate jobs. We cooked up a bunch of Paleo friendly food over the weekend, and Justin prepped all his lunches for the upcoming week too. I typically just ate leftovers for lunch, and we were able to mostly breeze through the work week, at least when it came to food. Nowadays, we still meal plan, but our lifestyle is a little more forgiving during the week thankfully. 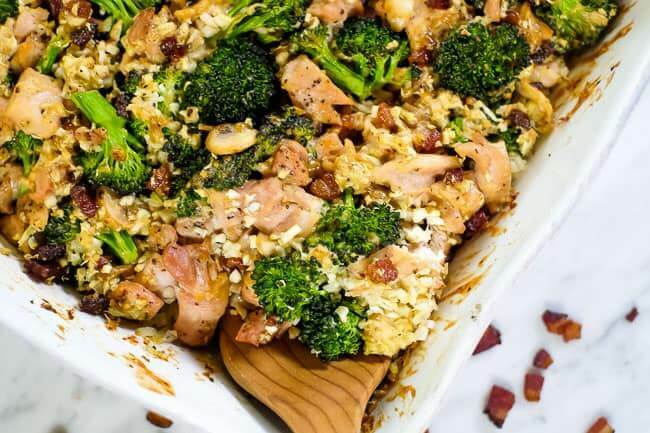 We do still love to make a big dinner Sunday most weeks though, like this Paleo + Whole30 healthy chicken and broccoli casserole and have the leftovers in the fridge the following week. There is just something about a creamy casserole that gives me all the feels. It’s cozy, soul-satisfying and just all around makes me feel good. 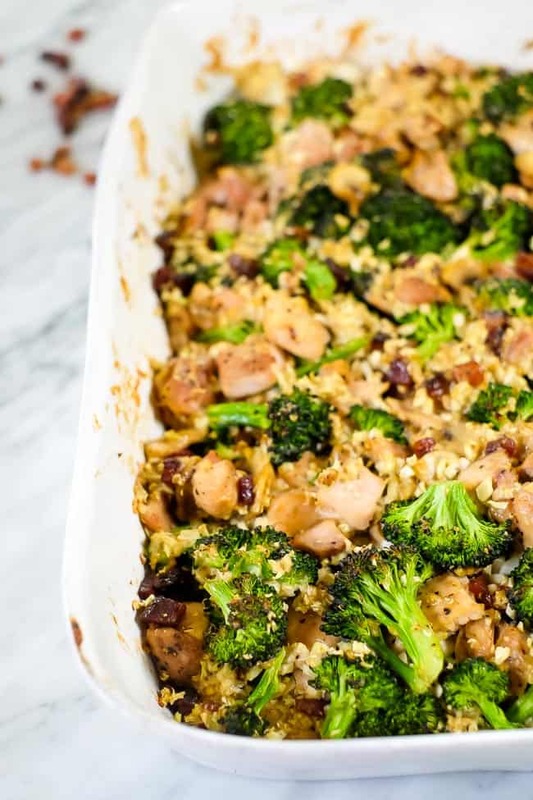 This healthy chicken and broccoli casserole lacks nothing when it comes to creamy goodness! 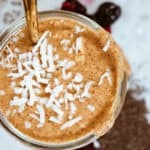 It is dairy-free and instead uses coconut milk to add in some healthy fats. And of course, bacon doesn’t hurt when you’re trying to up your comfort food game! 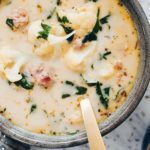 Lots of folks get a little scared when they see that there’s coconut milk in a creamy comfort food recipe. They don’t want the coconut flavor. Guess what? You won’t taste it! This recipe, and many of our creamy, comfort food recipes have coconut milk in them in place of dairy. BUT….Fear not, we’ve become masters at masking the coconut taste. 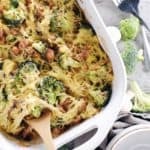 You’ll just be enjoying the creamy, rich texture and flavors of the rest of this healthy chicken and broccoli casserole! You can of course rice your own cauliflower in a food processor, either using the grating attachment or the regular steel blade. Just be careful if you use the steel blade. It’s easy to over process the cauliflower. We recommend processing in batches if you go with the steel blade. An even better tip though is to get it pre-riced at your local grocery store. We are able to find it locally at Trader Joe’s – either in the fresh produce section or in the freezer section. You should also be able to find riced cauliflower at other health food stores like Whole Foods. 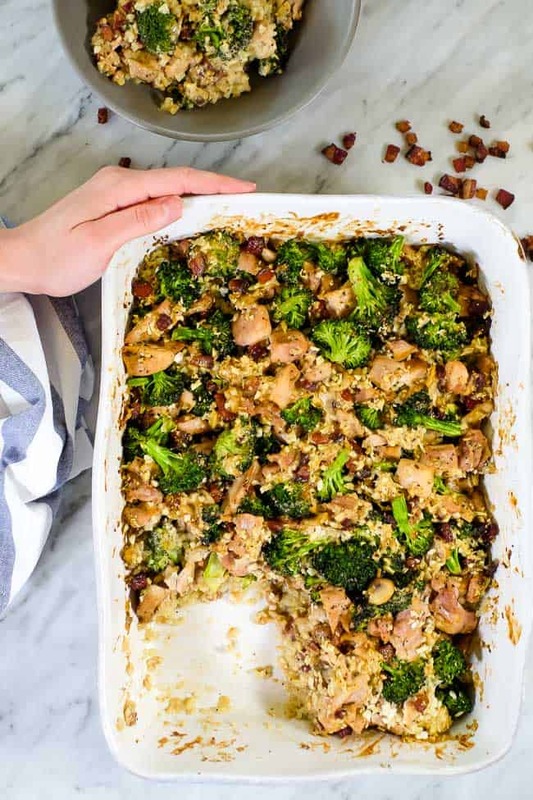 Whether you just want a large meal to make over the weekend for dinner and then enjoy the leftovers the following week or you’re straight up craving comfort food, make this healthy chicken and broccoli casserole! Let us know what you think by leaving a comment below. Take a picture and share it on Instagram – tag us @realsimplegood. Also, if you don’t already follow us on Instagram, make sure to give us a follow so we can stay connected! 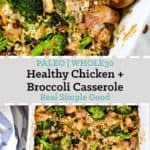 As part of our weekly meal prep, we love to make a big dinner Sunday, like this Paleo + Whole30 healthy chicken and broccoli casserole and have the leftovers in the fridge the following week. 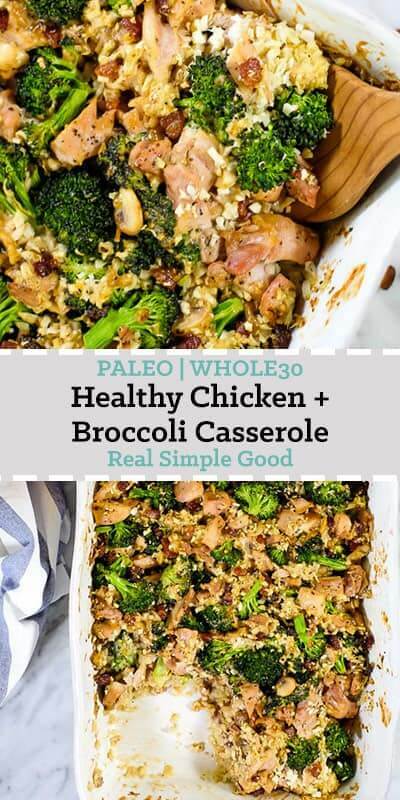 This casserole is a great, Paleo + Whole30 family-friendly and large dinner recipe! Grease a sheet pan with avocado oil and place chicken on the pan. Season lightly with salt and pepper on both sides. Place in the oven to cook for 6 minutes. Remove, flip and place back in the oven to cook for 6 more minutes or until cooked through. When the chicken has finished, set it aside while you make the rest of the ingredients and turn the oven down to 400° Fahrenheit. Prep bacon, cauli rice, broccoli, mushrooms and garlic as noted. Heat a large skillet over medium heat. Add in diced bacon and cook, stirring occasionally, until it just starts to get crispy, about 6-7 minutes. Remove and place on a paper towel lined plate. Now, prepare the creamy sauce. Using the same pan you cooked the bacon in over medium heat, add mushrooms and cook until they begin to soften, about 2 minutes. Add in the arrowroot flour and minced garlic and stir around to mix well with the mushrooms, about 1-2 minutes. Next, slowly add in the coconut milk, stirring constantly for 2 minutes. Be sure to mix well to dissolve all of the flour into the milk (you don't want any flour clumps). Use a whisk to mix if needed. The sauce will bubble and thicken, keep stirring to prevent burning. After 2 minutes turn heat down to low and simmer. Stir in salt and pepper. Now, put everything together. Grease a 9x13 baking dish with butter, ghee or coconut oil. Chop the cooked chicken into bite sized pieces. 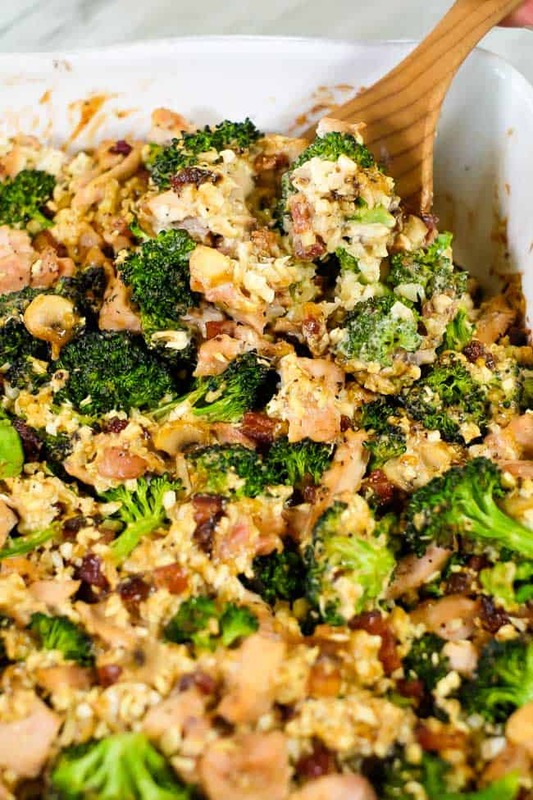 Add the cauliflower rice, broccoli, chicken, bacon and creamy sauce to the baking dish. Carefully mix everything together well with a spoon. Place back in the oven to bake for 20-25 minutes. Remove and allow to cool at least 5 minutes before serving. This looks amazing! 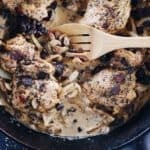 Reminds me of a healthy paleo version of a casserole my mom use to make us as kids. I’d love to know a substitute for the coconut milk. I have a sensitivity to coconut proteins. Could a nut milk w/ added gelatin help? I’m assuming coconut milk was used because it’s much thicker. TIA!!! Looks delish! 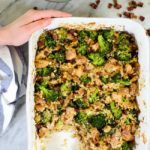 Do you cook the broccoli at all before or just add it in raw prior to baking in oven? Do I put the casserole in the oven at broil again for 20-25 minutes once it’s all mixed? The directions didn’t say what temperature to put it in for. Wow! So good! My whole family enjoyed it! Made this tonight. Was just okay. Took a while to prepare – almost two hours, so will probably not make this again. Sorry to hear that it just turned out ok for you. We hope you find some other recipes on our site to try that you prefer. 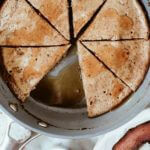 Almond flour wouldn’t thicken as well so I’d recommend tapioca starch or cassava flour instead. If you omit the flour entirely it would work too, the sauce just won’t be quite as thick. Let us know how it goes! I used almond flour and it turned out great. My teenage son loved it. Oh that’s great to know that using almond flour worked. Thanks for letting us know and we’re so glad you enjoyed the recipe! This was very good. I used almond flour. I would definitely make this again. Didn’t realize this recipe calls for coconut milk out of the can, rather than coconut milk you’d find in a carton in the dairy aisle. Guess I should have clicked the link to Amazon before buying ingredients. 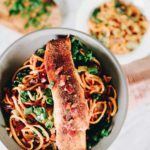 Used chicken breast and turkey bacon to make this healthier. Smells good but is more like a hash than a casserole because nothing set. Bummed out. Sorry this didn’t turn out as anticipated, but hopefully it tasted good! Any full-fat coconut milk should work, the link is just a recommended brand that we know doesn’t have any additional unwanted ingredients. Either way, it won’t “set” completely but will have more of a creamy hash texture. Could you make this in a crockpot? Cooking the bacon first then adding all the other ingredients?! I’m a mom of 6 and like things as simple as possible ? thanks! Sarah – we haven’t tried it, so I’m not sure. I’d worry about the broccoli and cauliflower getting overcooked, so maybe add that in after the chicken?You’ll have to let us know how it turns out. Hi! 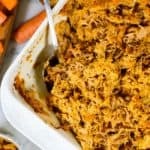 If I use frozen cauliflower rice, should I microwave it before I add it or leave it frozen and let it cook within the casserole? Thanks!! I think you should thaw it before putting it in, otherwise it might get watery. This recipe was an epic fail… I used Tapioca Flour (as noted on the Whole30 Instagram post) and followed instructions accordingly. When I added the flour to the mushrooms and combined, it created little clumps. I was unable to break up them up after adding the coconut milk & whisking a ton! The “sauce” ended up binding together too much and created more of a gravy and since it was so thick, there wasn’t enough to spread and cover the veggies & meat. Please consider adjusting the ratios going forward if you are going to suggest Tapioca Flour… I think that was the issue for me. In the end, I just mixed everything up again and served in a bowl as it looked more like a stir-fry. Honestly, the flavors don’t really marry well either… the coconut milk overpowers everything & the Tapioca just gives it an odd texture. Sorry to hear that this recipe didn’t turn out for you. We tested it several times and have used both arrowroot & tapioca flour so I’m not sure why the consistency didn’t work out. Thanks so much for sharing this. I tried this with a few of my own modifications and it turned out wonderful! I roasted the fresh broccoli florets in a little olive oil, salt and pepper for about 20 min at 400. After cooking bacon, I omitted the mushrooms, sauted the garlic in the bacon grease, and added the arrowroot after a few minutes, stirring to ensure no clumps. At this point, I added salt, pepper, onion powder, garlic powder, and italian seasoning. I used riced cauliflower, but I used the pilaf version with peas and carrots. I also added 2/3 package of shredded Daiya brand vegan Mozzerella. 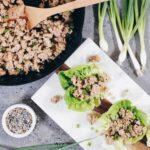 Everyone in my house had 2 servings – they didn’t know I used cauliflower or Daiya shreds instead of real cheese! Sounds great, glad you were able to modify it for the whole family to enjoy! 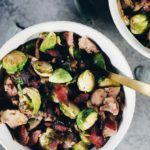 My family is picky and I have a hard time finding a dish that we can all eat-and like. I followed this recipe without any changes. It turned out to be great for my entire family. I appreciate the time you took to post your recipes. Thank you! I made this today! The only change I made was to use home-made coconut milk (due to my dietary requirements). It was a really wonderful dish that I really enjoyed; the flavor combination and texture was very satisfying. Thanks so much for sharing! Thanks for trying and we are glad you enjoyed the recipe! My mouth is watering this looks so good. It tastes just as good as it looks! Hi there, can this recipe be freezed? Thanks! We haven’t frozen this recipe so we can’t advise the best way to do it.